This is a guest post by Jerry Noel. In this article we’ll discuss designing your solar electric system. In Part 1 (Solar Electric Basics), Jerry discussed the three predominant questions of solar power: cost, batteries, and “DIY”. Part two provided Emergency Power Options. Article 3 discussed three types of home solar power projects and how to mount your solar panels. Now that you determined in the previous article (Solar Site Check) that we have a good location for a solar array, we have to start on the design of our system. Note: The National Electrical Code defines a “module” as a single power producing device. A “panel” is a group of modules physically connected together. Instead of referring to them as solar panels, I will use the more correct terminology of “module”. What is an Inverter? What the Difference Between Central Inverters, Microinverters and AC Panels? An inverter converts DC (direct current) that is produced by the solar modules into AC (alternating current), which is used by most devices in a typical home. In the past, we were forced to use a large DC to AC inverter that had to be placed somewhere. These inverters are still very good, and I am fond of the Kaco Blue Planet series shown in the picture below. The central inverter should be located in a basement or garage. The cooler temperatures make them more efficient just like any other electronic device. The drawback of the central inverter design is that you are required by code to have the p-v array output conductors (high voltage DC output) in a metal cable or raceway from the point of entry to the first disconnecting device. This means wires run in conduit or MC cable, not PVC or romex. Another disadvantage is expandability. Once you design your system, it is unlikely that you can expand your system without purchasing a larger inverter. If the inverter fails for any reason (yes, this does happen) your system could be without production for a week until a replacement arrives and is installed. The main advantage of a central inverter design is in it's flexibility. The free design template that each manufacturer provides can show you how many modules you can connect to their inverter so you don’t exceed the power or voltage ratings of the device. This allows you more choices in which modules to purchase. Another advantage is that the most expensive and delicate part of the system is in a protected location. Newer to the industry are microinverters. They are small electronic inverters that bolt to the rails under the modules; one inverter to one module. Enphase is the most common type currently and other manufacturers are in the process of designing their own. Enphase also has developed the D380 inverter that can handle two smaller sized modules. Another new development is the AC module. Exeltech has teamed up with Helios Solar Works of Milwaukee to create these modules. It is a microinverter that is designed for a specific module and connected at the factory. Advantages of both include an easy “plug & play” design. Inverter outputs are already 240 volts AC and connect together via a special cable that combines the output amperage. 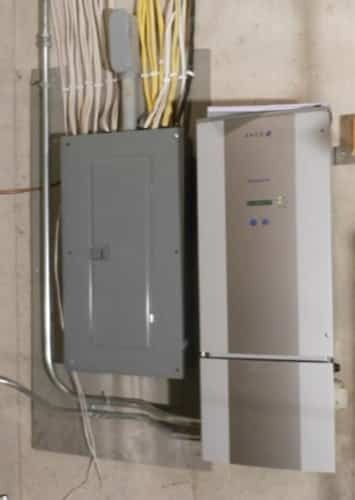 The cable is then connected by standard building wiring and run to the electrical panel. A tremendous advantage is expansion ability. If you can only afford 2 modules to start you can simply purchase more when you have the money, mount them with the other, plug them in and you are done! Shading losses are also minimized since the inverters are all separate. One shaded area won’t drag down the entire array production. A disadvantage of both is that you are putting the most complex piece of equipment in the harshest of locations; on the roof. If one goes bad (yes, this also happens) it doesn’t take out the entire system, but you have to climb onto the roof and replace it; easy for a ranch, but how about a 40° 2nd floor roof in winter? Modules are connected together for strength; removing one from the middle is a daunting task unless you have a crew of 4 at your disposal. The microinverter has to be correctly sized to the solar module. Currently, Enphase inverters can only handle modules with a maximum output of 270 watts. The newest trend by manufacturers is to make larger modules and cutting down manufacturing expenses per watt. The same trend among installers is using 300+ watt modules. A 350 watt module takes just as much effort to install as a 200 watt one. Less labor and more output lower system costs. The AC module has the microinverter installed at the factory and has NO user serviceable parts. If the inverter fails, the whole module must be replaced. That is the $10,000 question. There is no simple answer; there are features of all three that I like. I like to buy products made locally, so that means I want to use Helios modules. Milwaukee has given us great American icons such as: Harley Davidson, Briggs & Stratton, Sprecher Beer, “Happy Days”, and “Lavern & Shirley”. Do I use the ones with microinverters or a central inverter? Since I have a small area and have no possibility of expansion, I will opt for the larger modules with a Kaco inverter. What Size Should my Solar Electric System be? Since area is limited, I am going to optimize per square foot output. The Helios 9T6 line delivers the biggest bang, starting at 395 watts up to 420 watts. The top ones command a higher price, so I will opt for the 400 watt modules. Next: how many can I fit in the limited space? At 6’6”tall x 4’3.5” wide we need to get out the slide rule and do some cipherin’. The rectangular area of the roof is 16’ wide lower edge by 11’ deep. A quick glance at the module size tells me that the large ones don’t work with that space. So let’s look at the next smaller size. The 72 cell modules are also 6’6” high, but only 3’3” wide. If I mount the modules in “portrait” formation, I can get three modules high by two rows wide. That gives me six 300 watt modules; 1.8 KW nominal output. I could probably fit in a 7th, but that would look odd. Kaco has an online string sizing tool where you can play with all kinds of combinations. First, you need to know your maximum and minimum ambient temperatures. These set the limits for your system. PV modules produce more electricity when they are cold; as much as 25% when bitterly cold (like here in Wisconsin). Too many modules in a series can send a dangerous spike of voltage into the inverter and smoke the internal circuits. Conversely, when it gets too hot in summer (remember they are on a roof) amperage produced is reduced. If module output voltage gets too low, the inverter can’t work so you have a set of very expensive shingles. For Madison, I use a low of -28° C (-18°F) and a high of 34°C (95°F). These are from the ASHRAE handbook. Bill Brooks Engineering has a free manual with these temperatures for across the country. This manual is imperative to have for anyone thinking about installing a system. It has templates and drawings to help you through the permitting and inspection process. After inputting the temperature, I enter the “HeliosUSA” in the module manufacturer dropdown menu. The next dropdown will show all the modules that Helios makes for USA customers, as opposed to their European market. Finally, I search for an inverter that will accommodate my six 300watt modules. The results shown in system production, DC watts, indicate that the 1502xi inverter can handle between 5 to10 modules depending on the conditions. “STC” stands for Standard Test Conditions (laboratory testing) for which all modules have ratings for an “apples-to-apples” comparison. “PTC” is a more real-life PV USA Test Conditions and are the ones commonly used for more accurate performance. So my plan for having six Helios 7T2, 300 watt modules is compatible with the Kaco 1502xi inverter. These website calculators are only for approximation, the designer MUST do the hard calculations to verify the system parameters. That class is a four hour lesson with PowerPoint’s. There is no way I am going to try to explain it here! What’s next? Comparing actual electrical usage to projected production. Next article compare our actual electrical usage to projected production using the Pathfinder shading analysis in conjunction with the PV Watts projections and compute payback time as well as Return on Investment. Future articles will delve into the less glamorous, but just as important stuff: mounting rails, roof flashing, grounding etc. You can’t just bolt these things to your roof, mounting rails are needed. 95% of all call-backs are roof leak related due to improper penetrations. Improper mounting will cast you for a lead role in an Allstate “Mayhem” commercial. If the system isn’t grounded properly, one lightning strike will toast your nice system and annoy your insurance company! DSIRE is a comprehensive source of information on state, federal, local, and utility incentives and policies that support renewable energy and energy efficiency. This is a great article! My friend have tried this in their house but used a little solar panel. Yet, he saved a lot of money. I will definitely try this after finishing other home improvements. Thanks for sharing! Greetings! I’ve noticed you have a dead link on this page ( Helios has gone out of business). So I was wondering if you would like to replace it with a wiki article I’m currently fixing up to be more informative. It’s on Eurosolar, German Non-Profit green organisation with a lot of history in European green energy business, It would help out a lot, and it’s something to have there until you can find something else to replace it with.